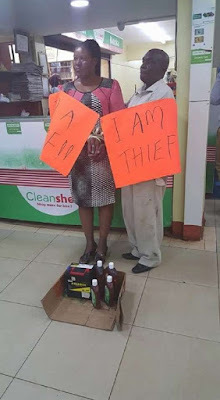 A man and his wife who were caught red-handed shoplifting in a supermarket in Nairobi, Kenya, were given the disgrace of their lives when they were beaten up and made to carry placards indicating that they are thieves, Tuko.ko reports. The couple, believed to be in their 50’s, according to the reports, were known for their notoriety in Nairobi supermarkets especially the popular Eastmatt where they were caught months back, after stealing electronic equipment. The shop attendants who caught the elderly thieving couple, said they noticed the couple making suspicious movements inside the store before they were caught trying to exit the store with goods stuffed inside their private parts. To teach them a lesson and serve as a warning to the public, the supermarket security paraded them outside the store with the goods that they had stolen. In their hands, they held up high posters reading ‘I am a Thief’.